DEJLIGT GYS! Det 9. store Another Rainbow litografi af Carl Barks, udsendt i 1986. Nr. 201/345. Sjældent set motiv. Carl Barks: "Dubious Doings at Dismal Town", Another Rainbow 1986, regular edition nr. 201/345. Et vanvittigt stemningsfyldt og smukt motiv. Kunstnerisk et af de allerbedste Barks-malerier. N.B. Bemærk at fotos ikke viser det aktuelle nummer, der er til salg, men et tilsvarende tryk. Signeret af Carl Barks. Meget flot stand. Regular edition - 345 eks. Mål: 53 cm x 63 cm. Carl Barks Dubious Doings at Dismal Downs Regular Edition Lithograph #9/345 (Another Rainbow, 1986). 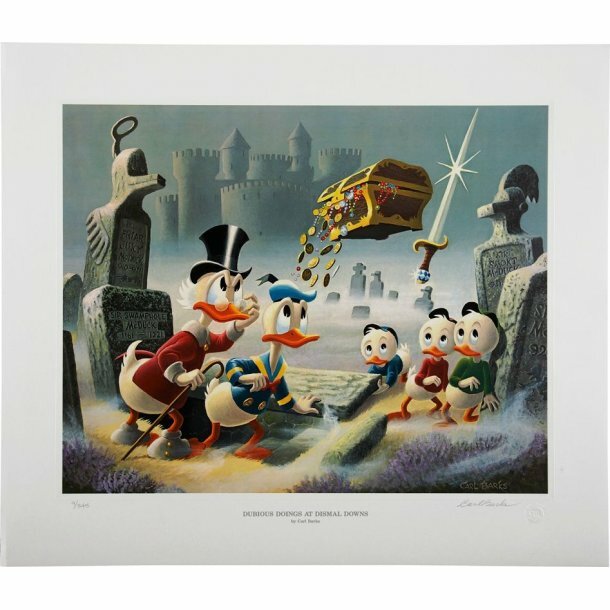 Uncle Scrooge and his nephew Donald Duck, and Huey, Dewey, and Louie Duck are spellbound by an apparition carrying a chest of treasures and wielding a jewel-encrusted sword, in this continuous-tone, twelve-color lithograph. This is the ninth Carl Barks lithograph in the Another Rainbow series. The print measures 25" x 21.5", with a 20" x 16" image area. Signed by Carl Barks and in Excellent condition. Includes a Certificate of Authenticity.